In the 70’s, Formiguères, emblematic capital of Capcir, deserves to have its own ski resort. The mayor François Picheyre, anxious to guide his town towards new touristic ambitions will respond to the appeal of his fellow citizens by setting up the two first ski lift on La Calmazeille. In 1983, François Picheyre hands over to his successor, Valentin Canet, who is increasing efforts to develop the ski area. He filed a New Tourist Unit (NTU) and achieved an important series of investments. The most important is the construction of a reception building at the bottom of the slopes, inaugurated by all the key figures of the department in March 1986. In 1989, the new mayor Claude Chirstofeul applied the NTU of his predecessor and added two additional chairlifts that were established on the top of the slopes at nearly 2400m and allows access to a natural ski in the middle of old pines. From the 2000’s, this is under the leadership of Yves Baso that were developed the reception buildings and the snow factory. In 2003, the resort of Formiguères obtained its first ISO 9001 certification for the quality of its maintenance. Today, these are all the services of the resort as well slopes, maintenance, damages, marketing, ticketing that are certified Quality. Over the years, the resort knows a significative growth in its attendance and the popularity of the resort has a great impact on the region’s economy. 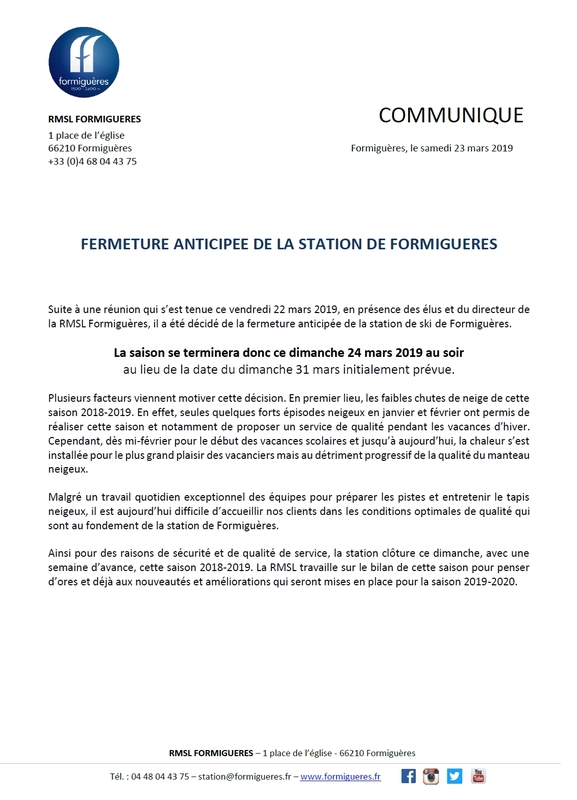 Formiguères is recognized as a family winter resort and an essential cross-country skiing resort. So in 40 years, the town has built a remarkable balance thanks to the successive mayors and all the inhabitant of Formiguères who were able to defend an exceptional heritage. Snow and ski have always been part of the history of the village :moving on skis, having fun, taking part to alpine or cross-country skiing competition. A first snow lift improves the rise of the slopes for the school children. Then, a road of 4 km functions as a link between the village and the Calmazeille site, well-known to older people for its exceptional snow. This road winds through a beautiful landscape among the pine trees to drive to the bottom of the slopes of the newest ski resort : Formiguères. Three chairlifts are already operational, a red slope is approved and a green one are offered to the numerous fans. The young ski resort began its promising first steps with a perfect snow. In 1975, the mayor of Formiguères Mr. Picheyre is pleased to have tried the adventure of the winter sports in order to breath new life to his village. Formiguères, that counted 75 farms thirty years ago, had only 13 farms and 25 children in 2 classrooms of the elementary school. We had to think about a solution for the existence of the village : the tourism sector. The summer in Formiguères was a favourite destination for its accessibility and weather. So, a window opened on winter season. The reception building was not yet opened and the car park was already full with more than 2000 skier. Formiguères had become a little ski resort to watch. In February 1976, hundreds of young schoolchildren stormed the four slopes of the resort in Formiguères. A red, blue, green and yellow slopes were supplied with four chairlifts of the Municipal State operating continuously. After the relaxing ski at the heart of a splendid forest, we had to satisfy the fans of strong sensations. It is in this way that the first black slope appeared and complemented relaxing and walking to the resort. The black slope permitted to young skiers to improve and remain true to the family ski resort of Formiguères. New facilities, new services and new look. True to its image, the resort is modernizing but the spirit remains the same one. More than ever aware of the present and future challenges, the resort gives its best to anticipate and meet customer needs. The art is not forgotten: a mosaic depicting the joys of snow awaits you at the top of the central staircase. Performed by the women of the village, the mosaic uses the method of trincadis dear to Gaudi. WiFi access will be extended to the entire resort and the snow front will be fully covered by broadband available to everyone. So you can live share your experience in Formiguères with all your friends by being our first ambassadors. The environmental protection is the central issue of a winter ski resort. Unique in the town, a ski slope entirely dedicated to leisure spaces with 3 km bumps, border-kid or border-cross as well as wooden modules fully integrated into the landscape. All the snow front is also implemented with the integration of a giant air bag, a ski kindergarten and a beginner’s area. In addition to the traditional festivities of Christmas and New Year, the resort sets up new events and launches important athletic events. By demarcating the cross-country skiing routes at the heart of the ski area, Formiguères offers dedicated events including “Timed climbing” organized every weekend. In the program : surpassing oneself, endurance and performance. Great ski touring race that will connect both the ski resort of Les Angles and Formigueres.